It wasn’t just the three-point barrage that sunk the Spurs. 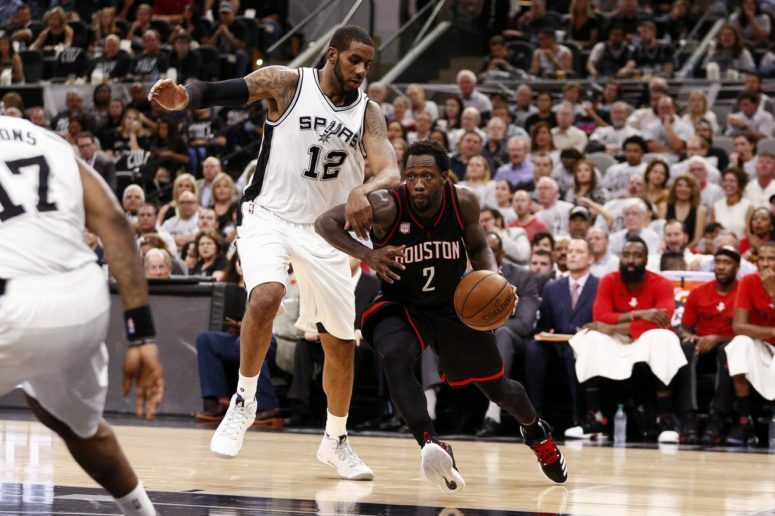 Game 1 of San Antonio vs. Houston was the perfect storm of the Spurs’ weaknesses (athleticism, wing depth, multiple playmakers) being exaggerated by the Rockets’ strengths (athleticism, pace, shooting). It’d be unlikely for the Rockets to keep connecting on 44% from deep while jacking 50 attempts per game. It’s not sustainable. This is a team that shot 35.7% on 40.3 attempts per game during the regular season, and bricked their way to shooting 28.4% on 33.8 attempts per game in their first-round series. 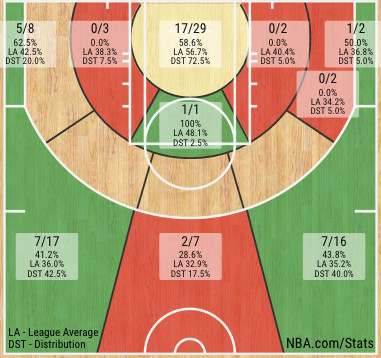 Granted, their shooting woes against Oklahoma City were also an aberration: few expected Ryan Anderson to continue to shoot 12.5% from deep. But, we already knew the Rockets were capable of single-game supernovas from behind the arc. What’s more troubling was how much the visitors dominated San Antonio in the other facets of the game. When you look at the end-of-game team stats like points in the paint and fast break points, you might believe that the teams mostly played to a draw in those specific areas. However, the competitive portion of this game was over before the fourth quarter began (well before), so it’s important to look at the stats prior to garbage time to get a real understanding of the story behind the numbers. 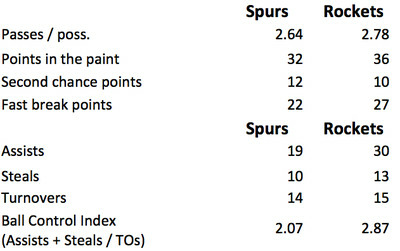 Starting with points in the paint, per the Four Factors chart below, the final tally was Spurs 32 – Rockets 36. But, that’s misleading because if you only look at the first three quarters, the Rockets outscored the Spurs by 20 points (36-16). It’s an alarming disparity when you also consider how many threes the Rockets were launching. It speaks to one of the more common criticisms of the proliferation of the three-point shot. Critics say that when you fall in love with the three-pointer, you end up taking worse shots, forgoing closer looks. But in reality, when the three-pointer is dropping, it opens up the floor and allows even more opportunities at the rim. After the Rockets’ opening barrage of threes, the Spurs had to run them off the line, leaving the interior vulnerable — as in this play where LaMarcus Aldridge keeps Eric Gordon from shooting a three, but yields a gimme instead. The Spurs led the league this regular season in rim protection, holding opponents to a 49.1% success rate on their shots at the rim. Last night, Houston made 60.7% of those looks, per NBA.com. A lot of the responsibility here is going to fall on Aldridge. During the regular season, among the 68 players to defend at least 300 shots at the rim, Aldridge was the best rim protector in the league, allowing just 43.8%. That ranked him just ahead of Rudy Gobert (43.9%) and Draymond Green (44.0%), the two leading Defensive Player of the Year candidates. But whereas Aldridge was an absolute monster at the rim during the regular season, Monday night he was a ghost, defending six shots at the rim, for five made buckets (83.3%). The fast break totals are also misleading. By the end of the game, the Rockets had just a five point edge (27-22). But, going into the fourth quarter, the Rockets had a 27-9 advantage, driven primarily by Houston’s 19 points off turnovers. 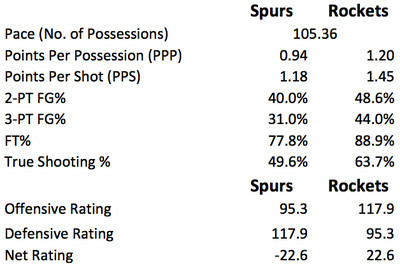 You can’t point to just one thing that the Spurs will have to improve to ensure a different result in Game 2. At the very least, it will require the bigs (hopefully including more Dewayne Dedmon) to protect the rim more stingily. It will also require better shooting performances from Danny Green, Tony Parker and Patty Mills. 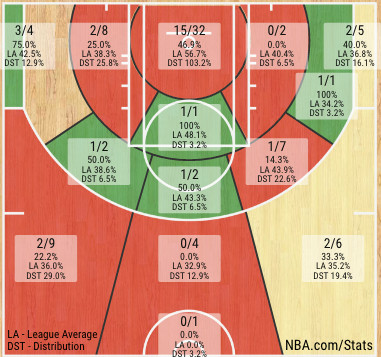 Aldridge needs to play at an all-around All-Star level, and expect that the Rockets outside shooting will regress. If you add all that up, the Spurs have a good shot at heading to Houston with a 1-1 tie.